Serve pasta and a salad to complete the meal. Stir together first 6 ingredients in a small bowl. Sprinkle steaks evenly with 1 teaspoon salt and pepper; rub with garlic mixture. Cover and chill steaks at least 2 hours. Sprinkle steaks evenly with remaining 1/4 teaspoon salt. Preheat a two-sided contact indoor electric grill according to manufacturer’s instructions on HIGH. 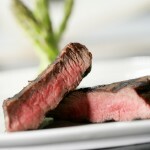 Place steaks on grill rack, close lid; grill 7 to 9 minutes (medium-rare) or to desired degree of doneness. Cut steaks in half. Note: When using an outdoor gas or charcoal grill, grill steaks, covered with grill lid, over medium-high heat (350° to 400°) 7 minutes on each side or until desired degree of doneness.